I was never a huge fan of meatloaf….in fact growing up my Mom made it all the time and I never really ate it. And if I did it was smothered in ketchup and the rest would be hidden in a napkin and thrown out after dinner. I did like the potatoes that she made with it. As I’ve grown up I still didn’t love it, but I have finally created a recipe that has added meatloaf to things I make! It’s simple, a one pan meal, and it uses ground turkey instead of beef. As you will see in a lot of my recipes I don’t cook a lot of red meat (I just don’t like the taste)…so I try to swap it out lot of times with chicken or turkey! It’s not that I’m against red meat or worry about the health aspect of it (obvii…just look at my other recipes) I just like the taste a bit better….this recipe pretty much tastes the same as ground beef, but it feels and tastes a little “lighter” to me. Mix all ingredients in a Kitchen Aid Mixer on medium until everything is incorporated. Using olive oil, grease the bottom and sides of a 13×9 baking dish. 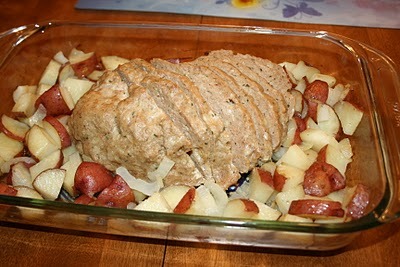 Form meat mixture into a loaf and put it in the center of baking dish. Cut potatoes into large, bite-sized pieces and sprinkle them in the pan around the loaf. Cut up some onions and sprinkle those around the loaf with the potatoes. Sprinkle the potatoes and onions with a little garlic salt. ***Halfway through cooking….remove foil and give the potatoes and onions a good stir around the pan so they get browned and don’t burn. ***Remove foil with 10 minutes left…so it gets brown on the top! You may want to slice a few pieces and make sure it’s not pink inside…sometimes depending on how thick the loaf is…it may need a little more time to cook. When it’s done slice and serve …….I still like mine with ketchup!!!! !